Japanese food, one of my favourite cuisine! This is one of the finer Japanese restaurant (apart from buffet style) I’ve been so far. Was blessed to be here too as it was a treat from a friend who is also a foodie. My repertoire for sushi is quite similar for most of my visit. I will usually go for Salmon (Seared, Sashimi, Belly and fried), Clams, Cooked Unagi (Eel), Inari (Beancurd Skin), Tuna sashimi and Scallops (cooked and sashimi). Of course I have eaten other sashimi/sushi which either didn’t suit my palate or made me wanting for more.For today, being spoilt for choice, I was able to taste a few new sashimi/sushi this time round! Some of them were Negitoro (minced Fatty Tuna), Meatball Sushi, Kyisu Sushi (sandwhiting fish),Shredded Crab meat with Minced crab paste, Susuki Sushi (Sea Bass). Among all the sushi I had, the Big Salmon was the smoothest and creamiest salmon I ever had. It had that OILY texture too which melts away in the mouth. Next that had my attention was the Crab sushi which was actually a full length crab meat and tasted so sweet! Lastly, it was the shredded crab and crab paste that was unique as well, just that the after taste of the paste was a little tad strong. Overall, it was an amazing experience to taste such quality sushi. 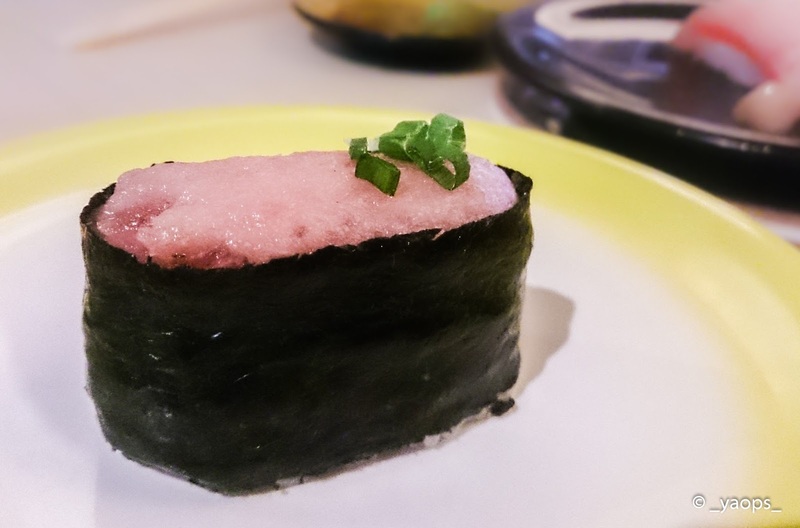 Somehow, the rice of the sushi was just different from other common sushi places. It was sticky, yet soft and tasty which didn’t give that jelak fill, amazing. Total bill was about $125 for 3 pax. I believe this outlet is reasonable priced for the quality they serve! Far left was a full length Crab leg sushi, insanely sweet tasting!